The history of Sunguard is still shrouded in mystery, ancient scrolls and tablets in their palaces, libraries , and temples point to a dark and violent past. Originally the Sunguard was a cult of the Sith originating somewhere within the Unknown regions of the galaxy. They where highly devoted to their religion and drew a spiritual significance from the sun, these ancient rituals required the collective focus of many participating Sith Lords, all considerably strong in the dark side of the Force. Arranged in a circular formation and joined by hands, those gathered began to chant an incantation that rapidly drew on the Force and channeled it into a destructive energy to eliminate their enemies with a single collective thought. Over a century before the time of the Galactic Empire, the culture of Sunguard developed a fixation on matters of the Force, especially a prophecy of a galactic savior known as "the son of suns", a prince to lead them in the new age, and until then, the Sunguard would remain in exile to protect themselves and their knowledge of the force. It would not be until hundreds of years later, "the son of suns" was born. Aries Rathakar, the son of a business tycoon inherited his fathers estate and continued the family business well into his twenties. During this time Aries traveled to a planet in the unknown regions where his father had recently purchased and began excavating ancient temples in order to build a new production hub. During his stay on the planet, he grew interest in the scrolls and tablets that were left behind in the ruins, and eventually began to unravel the mystery of the Sunguard. Unknown to him the ancient scrolls had a powerful control over him and began to change him considerably, the dark side of the force had swept through him almost instantly. By the time he left the planet his focus on the family business had been completely overrun by his insatiable desire to create a military force in the fashion of the ancient Sunguard. This new force would use the ancient teachings to their advantage to satisfy their lust of greed and power. The newly reformed Sunguard, and their dark warriors of the force known as the "Sunsect" have been unleashed unto the galaxy once again. 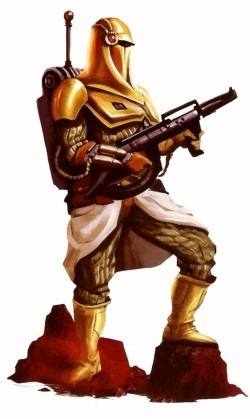 Armed with ritual pikes, vibroblades, jet packs, flamethrowers, dart launchers and rockets the Sunguard uniform was instantly recognizable and widely considered terrifying.